With themes about love, marriage and relationships that resonate just as strongly today as when the show first appeared, the 1978 Off-Broadway hit "I'm Getting My Act Together and Taking It on the Road" (book and lyrics by Gretchen Cryer, music by Nancy Ford) still has a lot to say. The work just finished a five performance run as part of the New York City Center's Encores! Off-Center series. 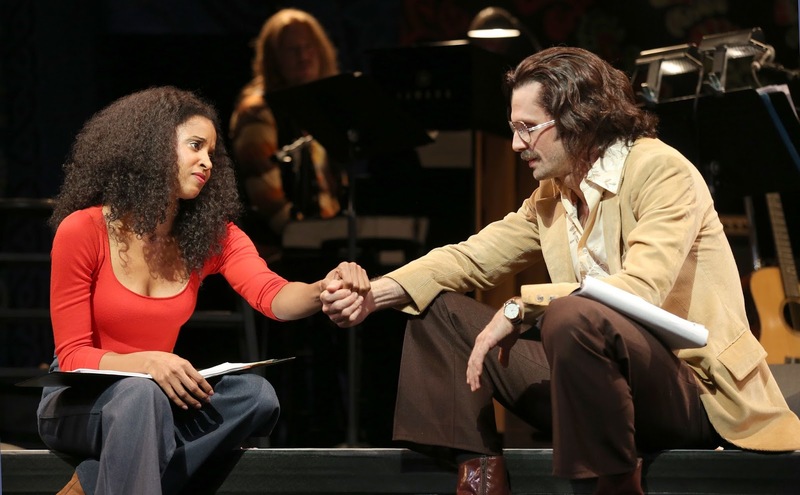 Heather (Renée Elise Goldsberry), a television soap opera star and musical talent to be reckoned with, has gone through some major emotional upheavals, including a failed marriage and becoming a single mom. Wanting to start a new page in both her personal and professional life, she has put together a musical/cabaret act featuring contemporary songs with an attitude - all of which help convey her own rebirth. Now, on the day of her 39th birthday, she's getting ready for her opening performance, said performance taking place at a New York City cabaret house where numerous members of the recording and entertainment industry will be in attendance. Their presence is due in no small part to the efforts of Heather's long-time manager and close friend Joe (Frederick Weller). However Joe is not at all sure that what Heather wants to present is something that's going to be accepted by the public. Trying to keep things more "mainstream," he wants her to cut all references in the act to her age, believing youth sells better than maturity. He also wants to take out a sketch showing the problems which occurred in Heather's parents' marriage, as well as one which examines the mistakes she made in her own - using a mock wedding ceremony complete with unrealistic marriage vows. Also on Joe’s list of moments that have to go is what essentially amounts to a diatribe by Heather on the problems men and women have in finding love and understanding with each other. At first Heather finds herself acquiescing, albeit reluctantly, to Joe’s demands. Heather has a great loyalty to her manager, the two having been through a lot over the years - including a brief romantic fling. Yet she soon realizes that unless she does her act the way she wants to, she'll simply be going back to the way things were. Something she is definitely not prepared to do. Dated in terms of dialogue used while timeless when it comes to the underlying issues, including looking at truths one doesn't want to see, "I'm Getting My Act Together and Taking It on the Road" works very well here thanks to a dynamite performance by Goldsberry. The actress offers a magnificent portrayal of a person who has clearly been through the emotional wringer and is beginning to come out the other side. 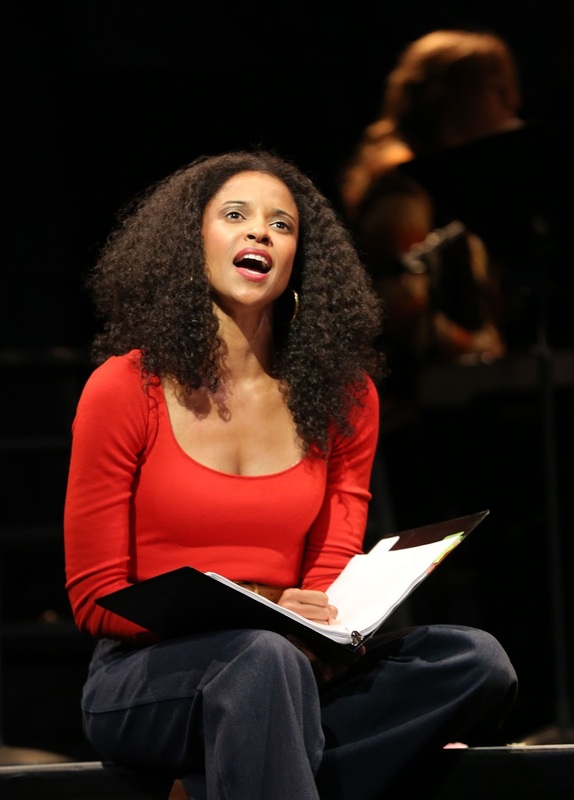 It also helps that Goldsberry has a tremendous stage presence, grabbing and holding the audience's attention and making one immediately start rooting for Heather to succeed in her journey. With a script filled with quite telling comments and observations, the overall experience works wonderfully. Any dated moments are nicely taken care of thanks to the show's scenic design work by Derek McClane which gives the entire atmosphere a sort of 1970s coffee house feel. Costumes by Clint Ramos also help to set the mood. The overall musical score is excellent, with numbers ranging from the hard driving "Strong Woman Number" to the more poignant "Dear Tom", a message to her ex-husband; and "Old Friend", a love letter from Heather to Joe, showing the deep and complex bond they share. Just as important to the story is Weller’s portrayal of Joe, a man who initially comes off as a sort of an anachronistic lounge lizard, but who slowly develops into the most shaded character in the piece. In lesser hands he could easily have been seen as not at all sympathetic, but Weller and director Kathleen Marshall are able to make the character work perfectly, thus forcing the audience to look at the various core issues not only from the women's point of view, but from the man's as well. All the while showing that no one on either side is completely innocent of using manipulation or of being manipulated. It also helps tremendously that Goldsberry and Weller have a good counterbalance to each other, both their characters giving off an undeniable chemistry. The rest of the company are all very good in their respective roles. Jason Rabinowitz does a nice turn as a young musician in love, or at least infatuated with Heather; while Christina Sajous and Jennifer Sanchez do very well as backup singers in their musical numbers with Goldsberry. Marshall's direction is also key; taking the piece, blowing the dust off and, except for a few brief moments here and there, making it seem completely fresh and alive. Touching, joyful, pulling no punches and never trying for the easy way out, there is a lot to like in "I'm Getting My Act Together and Taking It on the Road." A show that, with a cast like this, completely deserves to be resurrected somewhere else, and soon. Here's hoping that will happen. "I'm Getting My Act Together and Taking It on the Road"
Casting: Carrie Gardner, C.S.A./Stephen Kopel, C.S.A. Featuring: Renée Elise Goldsberry (Heather), Frederick Weller (Joe), Christina Sajous (Alice), Jennifer Sanchez (Cheryl), Jason Rabinowitz (Jake - Acoustic Guitar), Chris Fenwick (Piano), Alec Berlin (Electric Guitar), Damien Bassman (Percussion), George Farmer (Bass).